Here is a map showing New Market, NE of Huntsville, and the road. Tombstone of his wife Hannah Edwards Baker same location. William is alleged to have been born about 1775 in Guilford Co., NC. He died May 18, 1861. A marriage license was issued Jan 20, 1801 in Jefferson, TN, for William Baker and Hannah Edwards, but it is annotated "no return". Hannah Edwards was said to be 1/4 or more Cherokee Indian. Married: license Jan 20, 1801 in Jefferson, TN, Hannah Edwards (1768-1872). Henry Calvin Baker (b.1799 to 1801 - d.1870) married Dec. 16, 1825, AL, Ester Riddles. They had no children. He married second 25 Jan 1829 Mary Annor Norwood (b.1808). Mary is the daughter of Samuel Norwood of TN and Mary Logan. Mary A. "Polly" Baker (b. 1800 to 1805, KY or AR - d. 13 Feb 1886 or 1896) married April 1, 1819 Andrew J. Couch. Emily C. Baker (1 July 1809 to 19 - April/June 24, 1842) married March 17/19, 1835, AL, Abel Pennington (1814-1849). Martha Emily Baker married John Jones. They are buried in clay Cemetery in Painted Rock Valley, AL. Peter Skidmore Baker (10 July 1810/11, AL-Sept 4, 1869, AL) married 26 Mar 1837 Elizabeth W. Barley (1817-1878). William and Hannah moved to Madison co, AL near the present town of New Market about 1806 or 1807. In Valley Leaves, William and Hannah are mentioned quite prominently. Their home was said to have been a frequentl stop over for many travellers and politicians running for office. The Bakers were reported to have been exceptional hosts. From the Later History of Madison County, And, Incidentally, of North Alabama, "About the head of Hirricane Wm Baker purchased several hundred acres of land which formed the nucleus of the large plantation afterwards owned by him....during election times candidates frequently resorted thither...to seek the influence of the old gentleman and aunt Hannah Baker, his wife, a lady endowed with an usual portion of good, strong common sense and a judgement on shich it is said many of her voting neighbors were wont to rely in determining for whom their ballots should be cast." 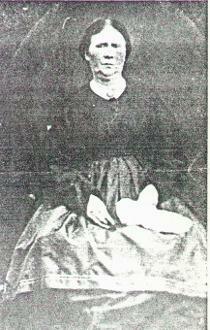 Sarah C. Baker (1836, AL-Sept. 1857) married Charles Mitchell. Both died at Mt. Meadows. Able Baker (1838, AL-Sept. 1857)also killed at Mt. Meadow. some sources list William Twitty Baker (1856-1937) married Elizabeth "Lizzie" Theodora Smith, as a child of John Twitty Baker. He was in fact the child of George Washington Baker and a survivor or the Mt. Meadows Massacre. Family oral history says the John T. held a primarly role in the formation of the wagon train that went west. However, all historical accounts list the group as Fancher's Company. The Mountain Meadows Massacre (click for special site) was a sad affair. A wagon train of people from Arkansas and southern Missouri was passing through Utah, near Cedar City. At the time tensions were high as Mormons had been murdered several years before by a mob in Independence Missouri. A portion of the US Army was marching on Salt Lake City to reassert federal authority over the Mormons. Someone, there is debate as to whom, ordered John D. Lee, the Mormon Indian agent, to incite the Indians to attack the wagon train and kill all the party, except children too young to talk. The Indians were not quickly successful, and after losing some men to gunfire, tired of the job. Lee was ordered to take some militia and finish the job. The settlers were ordered to surrender their guns and told they would be escorted through the Indian lines to safety. As they walked out each militia man was told upon orders to shoot the man next to him or if he had not the stomach to do it to sit down and let the Indians do it. It is not clear exactly how many militia men sat down and how many shot. Many were sickened as they thought until the that order was given that they were coming to rescue the wagon train. However, the church demanded loyalty and their state of war with the United States made them feel endangered. All the men and women were killed, as well as all but 17 or 18 small children. In total it is believed that 120 people were killed. One of the surviving children described as follows: "Captain John T. Baker had me in his arms when he was shot down, and fell dead. I saw my mother shot in the forehead and fall dead. The women and children screamed and clung together. Some of the young women begged the assassins after they had run out on us not to kill them, but they had no mercy on them, clubbing with their guns and beating out their brains." another survivor remembered: "Bewildered we stood there. The Indians, shrieking, shooting, yelling, tumbling down the slope triumphantly. For a moment the entire wagon train was frozen into immobility. I started to follow my mother and stumbled. The last I saw of her, she was running toward our carriage with little Billy in her arms. And the Indians were upon us. Now I could see they weren't all Indians. Whites had painted themselves to resemble their savage companions. With bloodcurdling yells they leaped on the defenseless pioneers. I sought shelter under a wagon and peered out between the spokes. I saw my father fall to the ground....One huge white man kept shoutin', 'For Jehovah!'". Another described, "...at the time of the massacre I wasn't quite three years old. But even when you're that young, you don't forget the horror of having your father gasp for breath and grow limp, while you have your arms around his neck, screaming in terror. After the deed was done, everyone was horrified and, realizing what they had done pledged a vow of silence. Some of the Indians later told, and some of the children were old enough to later recount events. The Mormons hung the blame on Lee, who believed he was following orders. It is another case of when persons feel under siege themselves, they will go to excess and harm innocent people who are at the moment perceived as part of the threat. History has so many examples, Wounded Knee, and in my own lifetime, a couple massacres by US troops during the Viet Nam War, the federal operations at Rosebud and Waco, and the bombing of the Federal building in Oklahoma City and a number of airplane downings and bombings. At least three related Baker families, as well as more distantly related members of the DeShazo and Tackett families died in the massacre. Outlander's History states that John Twitty's son John H. Baker was one of the scouts sent for help who was killed, but our family oral history indicates he accompanied his father the prior year in scouting out the route and locations in California. He could not have died in the massacre, as Sarah was not born until 1860. Twenty one Bakers and numerous other relatives died. From Outlanders (p.396-399): John Baker (1836), Sarah C. Baker (1836- 1857), Able Baker (1838-1857), Silas Baker (1840), Mary J. Baker (1844), Mariah Baker (1846), Peter S. Baker (1849). Able Baker family, Elizabeth, Ann Elisha, Margaret, Melissa, Almeda, David W., Alford T., Salinda. George Baker family, Minerva A., Mary Levina, Elizabeth, Sarah "Sallie" and William W. Baker. Charles R. Mitchell and familly. Three of George's children survived, William (various middle initials/names B., Welsh and Twitty) Baker, Martha Elizabeth "Bettie" Baker, and Sarah A. or Franicis "Sallie" Baker. William was raised by John H. Baker. Betty married into the Terry of Harrison, AR. Sarah married into the Gladden family. Allen DeShazo, brother to Elizabeth DeShazo also was killed. Elizabeth was the wife of John Henry Baker (who is said to have made a survey trip with his father the year before, but who did not go on this wagon train. Martin & Ann Hannah Clark Baker: Their history and wonderful collection of useful links to Bakers and useful genealogy sites.